I detest public lies that the liars know nobody in their right mind will believe, as they are insulting, dishonest (obviously) and degrade the culture by sending the message that lying is just a game., and being a liar is nothing to be ashamed of. I also detest fake forced apologies, in which individuals have been ordered by some authority to issue mea culpas or else, and the result is apologies so insincere that they border on parody. This statement by the producers of “Game of Thrones,” then, is especially objectionable, because it meets both criteria. Criticism, satire and humor regarding any U.S. President, living or dead, is fair, ethical and within the realm of the freedom of expression that makes America great. Incivility, disrespect, denigration, hate and incitements to violence directed against any President, living or dead, is wrong. However any of these men performed in office, whether their policies were popular or not and whatever the consequences, good or bad, of their decisions were, every one of them was a patriot and a public servant who made significant sacrifices to attempt to meet the challenges of the most difficult job in the nation, and to do what he thought was in the best interests of the nation. Eight of the 44—that’s 18%—were shot at. Five of the 44—-11%—were shot, and four of them died. The acceptance of the responsibility of the President is itself an act of courage. Evoking the intentional killing of a U.S. President in any context is irresponsible, and to mock a former and living President in the manner of barbarians and terrorists of other lands, to treat him as the terrorists treated Nick Berg, is as offensive an act of disrespect as I can imagine. It is obvious what happened here. A bunch of Hollywood snots decided that it would be funny, as well as pleasing to all “right thinking” viewers, to express contempt for President Bush in this way, and everyone on the set had a good laugh about it, because they have no respect for public servants who don’t cater to their biases, because they are hateful hypocrites (they would regard an Obama head as racist and unthinkable, of course), and because they are arrested adolescents. Then, once the indignation expressed to HBO became a threat to the bottom line, the cable honchos issued a demand for an apology. Fortunately I don’t watch “Game of Thrones,” so I don’t have to stop. You seem to be particularly prone, lately, to claiming intimate knowledge of your subjects’ beliefs and motivations. Even if it wasn’t intentional. I mean, it may have been, but I’m not seeing any hard evidence of that. I also don’t watch Game of Thrones (indeed, I don’t have television), but if the DVD commentary insisted at the outset that it wasn’t intentional, and if the scene required a large number of heads, necessitating, just as the producers claimed, ordering in bulk, then it seems perfectly plausible to me that this was an honest mistake. Obviously I didn’t see what was shown on screen, but the link you provided does show a screen grab. Unless they cherry-picked the image to best conceal the problem, it’s rather difficult to tell that the head is or resembles George W. Bush, since it’s shown at an oblique angle and has hair that is wildly different from anything worn by or easily imagined on the former president. If it was a political statement, its delivery was downright opaque and I dare say no one would have noticed it had the commentary not specifically pointed it out. The sentence after the quotation was, of course, supposed to be punctuated with a question mark. Please. They have not even denied that that the head was Bush’s. In other statements, they’ve said that his just happened to be among the prop heads, and they used it without thinking. I direct and produce plays. It’s a classic inside joke: prop heads are always incitements to gags. (The head even looks like Bush from the bad angle in the DVD.) If it wasn’t Bush’s head, then why apologize at all? If it was, nobody thought that was inappropriate? They would have treated an Obama head the same way? Considering the racial makeup of most of the fictional Westeros, Obama’s head would definitely stick out, especially in that scene, and require a backstory. The show aired more than a year ago, and no one noticed anything about it until it the producers themselves mentioned the head resembled Bush. And it does, if you squint and tilt your head the right way for the half second that the head airs on the show for that scene. HBO should not have apologized, because the entire issue is stupid. 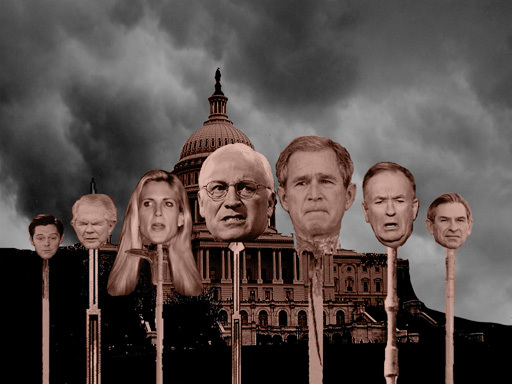 Right, deery, and that’s the only reason they wouldn’t use an Obama head…because it would seem out of place. Grab your own David Manning Award for that one. I defended a theater company coming under fire from the right for using Sarah Palin’s name in a classic British satirical song involving beheading famous people, and was attacked by a Tea Party wacko for doing so. But anyone who can’t see why objections to putting a model of a living ex-President’s head on a pike under any circumstances are “stupid” has exactly the same civic blindness as the people who put it there. It’s real simple. These guys deserve basic respect. It’s silly, mostly because it isn’t at all clear that it’s George Bush’s head. Even if it were, they have clearly gone through great pains to obscure the resemblance, when it could have easily been more obvious. If you have a bunch of heads, and one looks like Bush (or Kennedy or Clinton, or Lincoln, whatever), you might snicker at the resemblance, but I don’t see why you wouldn’t use it, especially when you mark it up so it doesn’t even resemble the president in question anymore. That head does not look like George Bush’s head, which is all that really matters. Here is the relevant video (head appears at 1:08 mark) http://www.youtube.com/watch?v=nRoVIpczcrY . That straw man is easy to knock over, Jack. Neither deery nor I asserted that anyone would be wrong to object to a depiction of a president’s head on a pike, and we certainly didn’t say that presidents don’t deserve respect. Rather, we were pointing out that this scene was not a depiction of a president’s head on a pike. If it had been, you would have every reason for outcry and HBO would have every reason to apologize. It’s simply not the case. Easy? On the dvd, the producers say that the head is George Bush, and that the series used the head for other decapitations. How much clearer can that be? In the apology, they say that that shouldn’t have said it…that is, admitted it. No, the head of a living President shouldn’t have been put on a pike on the set. What do you mean they admitted it? You mean they admitted that somebody pointed out to them that the head they already had on hand for the scene looked like George W. Bush? Sure, their apology was for admitting to that, and that’s all they needed to apologize for. Considering that they did everything necessary to conceal the resemblance, the fact that they pointed it out is the only reason why anyone knows whose head it would have looked like if it had had different hair and been shown directly. It seems like you keep demanding that they apologize for a political statement they didn’t intend to make. Why does their admission that they knew after the fact whom the head was modeled after get so much weight while their contention that it was neither political nor intention gets no weight whatsoever? How can you use their admission as grounds for asking “How much clearer can that be?” while simply ignoring the fact that a denial of ill intent was included as part of the very same admission? If you’re saying that they were telling the truth and lying at the same time, then the evidence for that could be a lot clearer indeed. Considering the head is very unrecognizable as Bush, and the producers have consistently maintained from the beginning that they were using random prop heads for budget reasons, I think it is outrage in search of a controversy. Dear HBO, for years I have subscribed to HBO via The Dish, but after not canceling Real Time with Bill Maher, as well as the “Head on a stick” issue with Game of Thrones” and the Head of Bush; I must say this goes beyond entertainment or freedom of speech.